Students taking this class have a good foundational skill set with a handgun, and ready to speed up their shooting. The class is designed to give students the skills needed to operate their pistol proficiently, accurately and quickly. This is a draw and fire course from exposed and concealed conditions. You will get to shoot on multiple targets under time pressure. You will learn how to instinctively diagnose and clear handgun malfunctions. 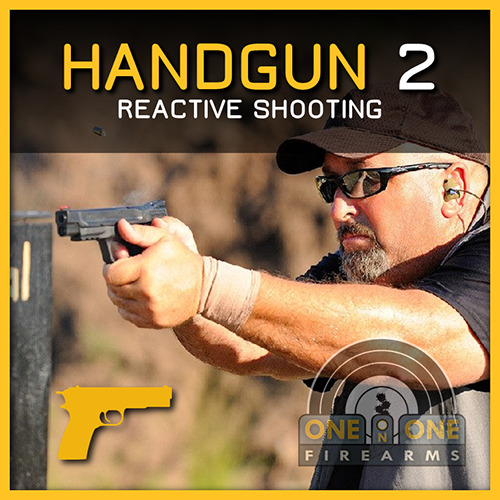 Students will leave this course with a greater level of confidence in their abilities to use their pistol in a defensive situation. COURSE OPEN TO: Students that have completed Handgun 1 Foundations or ONE on ONE Firearms CCW class. Setting your bar and how to raise the bar to improve performance with practice. Recoil Management for Rapid Follow Up Shots.